About: The Peking-Seoul Restaurant offers a varied selection of Chinese dishes throughout the day. Catering for private parties of up to 40 people is available upon request. A takeaway menu is also provided. This is the worse Chinese & Korean restaurant I have ever been to. Food portion is so small but pricy, the so called Korean rice is in fact is not Korean rice but poor quality rice. My friend and I ordered Korean BBQ, but the meat served wasn't fresh and we have been rushed and almost ordered by the waiter "can you BBQ all meat in one go? other wise the whole restaurant is too smoky" ... We did it as requested...but the mood to even try to enjoy food is completed destroyed. I must say after reading the reviews on this site I would be put off eating here. I visit London quite often and use the peking for sit down and takeaway meals and have always had good service and good food every time, I always order off the Chinese menu and been very happy with the food so can't say about other menu options. My only gripe is price but that's normal for London. For £9.00 the lunch special was very overpriced for quality. I would not recommend eating here! Restaurant looked nice from outside. Went inside, when it was not crowded. Took 10min for somebody to bother to come over and take an order. A lady, who looked like the owner, was chatting away to glory with somebody, giving all the personal details. Did not bother to notice that I was waiting there for a while (restaurant did not have many guests). I ordered just a beer and quick meal. They bring the meal first and forget the beer. I gently ask where the beer is. Somebody else brings the beer and just puts it on the table. I tell them that the beer has to come first and then the food. They all look at me as though I was demanding serious customer service. Reluctantly the waitress says sorry. I ask for a pint and get half pint. The food is supposed stir fried vegetables. But there is only chinese vegetable (whose name I forget) and feels like that probably is the cheapest in the market. A frustrating annoying experiece. Ruined my evening! On a recent visit to London discovered this restaurant which offered good service and food at a reasonable price. Staff were friendly and polite and the food was very good value for money. It was a very popular restaurant with locals and visitors. Would definitely recommend it to anyone who is looking for an alternative to all the Lebanese restaurants on the Edgeware Road. this is a terrible restaurant. The 1st thing we sat down, we ordered 2 dishes for 3 of us. The waitress said, you'll have to order at least 10 pounds per person, which it is not written anywhere inside or outside of the restaurant. The food was so so only. Finally, we had finished our dinner, and during the billing, they showed us the bill of 24.08 and requested us to pay 24.10 as it is another rule in the restaurant. It is is an unpleasant dinner, where the waitress are inpolite and there are so many unfriendly rules in the restaurant. It will only spoilt your appetite if you go there. 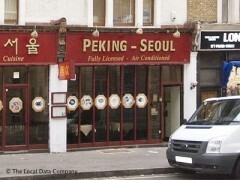 Was staying in London with family and tried the Peking Seoul as it was local to our hotel. The food was dry and clearly over cooked. When I told a member of staff I received a rude comment saying "they were too busy". Thinking she had misunderstood me I spoke to her again to which she again repeated that they were too busy. I was only looking for a replacement meal. DO NOT waste your money by eating here!